I am pretty much obsessed with any type of bread – I totally adore this carbtastic treat. And being a weight watcher, I had to just accept this fact and do my best to create weight watchers recipes that involved bread and were still low in points. And when I tried this Baked Croutons Recipe, I was absolutely thrilled!! I have always loved croutons and really feel that they make a salad so much more yummy and satisfying. But store bought croutons aren’t always weight watcher friendly. So, using some low calorie bread, I decided to make my own. And I must say, they turned out SO good, I will never go back to regular croutons again! 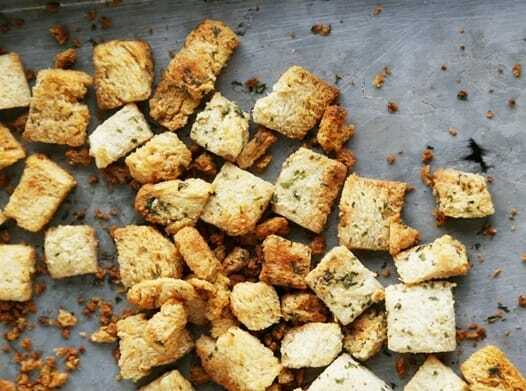 This homemade croutons recipe is not only amazingly delicious, but it’s full of fiber and has just a 1 Point per serving!! Truly the perfect salad topping. If you are a carb lover – this recipe is a MUST try. Preheat oven to 350 degrees. Spray a baking sheet with non fat cooking spray. While still frozen, remove crusts from bread; chop into bite-size pieces. Lightly coat bread with cooking spray and put into a large Ziploc bag. Add in salt, garlic powder, onion powder, Parmesan cheese and dried parsley. Close bag tightly and shake gently, but thoroughly, making sure that all bread pieces are coated evenly with seasonings. Place croutons on baking sheet and bake in oven until croutons are browned well on both sides. (You may have to flip croutons over halfway through the baking to ensure even browning).